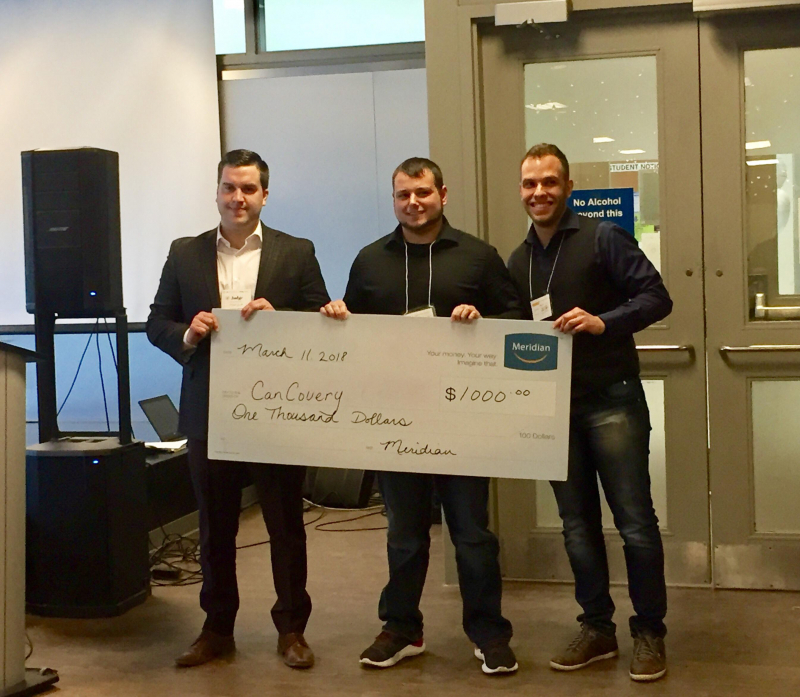 ncTakeOff Pitch Series - The Social Enterprise Start-up Weekend was held March 9th to March 11th, 2018, at The Niagara on the Lake Campus of Niagara College. Over the three days, Niagara College students developed their business ideas and business models with the help of eight of Niagara's industry professionals. Their ideas contributed to help solve problems in the one sector that connects us all: Social Enterprise. The event was hosted by ncTakeOff (Niagara College’s entrepreneurship hub) and sponsored by Meridian Credit Union. This was the first stage in the Ignite Pitch Series. Following the Startup Weekend model, the action-packed weekend kicked off on Friday night with a keynote presentation by McGill graduate, Founder and Managing Director of Code Niagara, Yashvi Shah. With a master’s degree in Information Systems & Design, Shah works at the intersection of business and technology and is invested in empowering the next generation of technologists and entrepreneurs in the Niagara region. This keynote presentation involved approximately 40 attendees, including community members, Niagara College students, faculty and staff. They were inspired by Shah’s success in social business initiatives. From there, seven teams formed, and their business development began. On Saturday, teams researched and developed ideas into business models with the support of eight local entrepreneurs and mentors. This network gave students the resources they needed to build their social enterprises They attended two workshops on social enterprise led by Leah Feor, and 'Pitching to Investors' with Chris Blanshard, Innovate Niagara. Teams worked late into Saturday night and early Sunday morning on their business models and pitch presentations. Teams inspired the judges with their pitches and competed for the grand prize package valued at $1,000, and five other business development services. 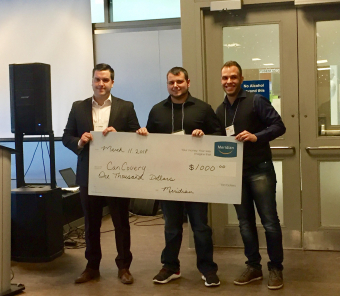 The grand prize was awarded to “CanCovery” – an app developed by Health & Fitness students, Andrew Newton and Jorge Siqueira. The free app would assist individuals who have beaten cancer (or who are in remission) develop exercise routines that help build their physical health in the face of extensive fatigue. Eric McKegney developed a takeaway/delivery only restaurant that would reinvest projects into local energy models. Customers would be able to choose what projects they funded based on a list of the pre-approved plan. His restaurant would source local produce and proteins and minimize the environmental impact of local businesses. “Bee Better” was presented by Gabriela Gitoi, Liam Clark, Gabriel Rodriguez, and Tara Ayer. This bee product subscription box exists to deliver quality beekeeping products directly to homes while highlighting local artisans and promoting sustainable environmental practices. Diego Astorga and Joel Knight developed “CocaDash”. Their coconut drink product would help enrich international students’ experience abroad by providing them employment opportunities, scholarships and co-op programs. Brennan Stowe and James Short presented “Health Connect”. Their mobile application would help people access fitness professionals anywhere with internet/wi-fi, even in rural areas. Their goal was to minimize health care costs and increase the overall health of individuals who have pre-existing health conditions. “Task Tackle” was developed by Cherriane Scott, Mengka Luo, Isabella Xu, and Grace Xu. Their international student community connection program would provide international students employment opportunities in Canada while assisting an ageing population with daily tasks. “This Space Can be Yours for the Right Investment’” was presented by Benjamin Neufeld and Matthew Arnold. They were promoting an employment matchmaking software that would help employers obtain new talent, provide comprehensive data insights, and help employees find stable employment. Keep an eye out for the second stage, Pitch Perfect on April 18th, 2018. Thank you so much for coming! Thank you to our sponsor Meridian Credit Union, and to The Armoury, our Judges, Mentors, and participants for making this event a success!